The weather in British Columbia is undeniably unpredictable. Rain is about the only constant. However when winter rolls around, that rain can turn to ice and snow making outdoor surfaces slick and treacherous. This is especially true of commercial and multi-family properties which tend to have more common areas, e.g. walkways, landings and parking lots. Thousands of people are admitted to hospital over the course of every winter due to slips and falls on ice. Make sure you’re prepared this winter with our friendly, reliable Pitt Meadows Snow Removal and Salting Services. Our program runs from December until March and we specialise in clients who own or manage a Strata, Co-Op, apartment building or commercial property. We understand the importance of being ready and prepared when frost and snow comes to Pitt Meadows. If you’re a property manager, do you really want to creep around in the wee hours Salting and Snow Removal ? Gorilla technicians can do that for you so you can stay tucked up in bed, knowing it’s taken care of. Our Gorillas are present to salt every exposed common area the night before any frost or snow prediction. Need your parking lot salted? Not a problem with our ‘Gorilla Mobile’. 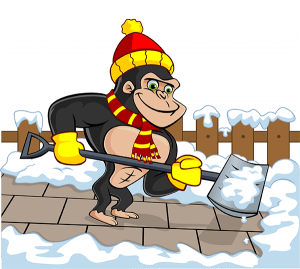 When snow falls on Pitt Meadows, our fully trained and licensed Gorillas are back in the early hours to clear it. People love their sleep and don’t like to be disturbed in the dead of night by noisy machinery. That’s why, where possible, snow removal is done by hand with a trusty shovel and a mechanical snow blower is about as loud as it gets.